Herndon Spillman has earned an international reputation for his interpretations of the works of the French composers. His international career has included recital tours in France, Germany, Switzerland, Brazil, and the Caribbean. 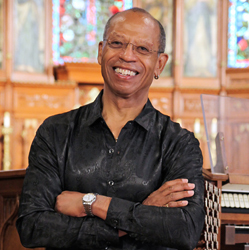 He has been a featured artist for several national and regional conventions of the American Guild of Organists (most recently for the 2015 regional convention in Charlotte, NC) and has also been featured at the French International Convention of the Fédération Françophone des Amis de L’Orgue. A protégé of Maurice Duruflé, Dr. Spillman is highly regarded as an interpreter of Duruflé's music. He studied with Duruflé for two years culminating in a doctoral dissertation, The Organ Works of Maurice Duruflé. Furthermore he was a contributing author to the book, Maurice Duruflé, The Last Impressionist, published in 2002 by Scarecrow Press. He produced the first recording of the complete organ works of Maurice Duruflé, which was awarded a “Grand Prix du Disque” from the French Academy of Records. Performances during the 2015–16 season took him to Cleveland and Chicago, among others. His early musical studies took place in Huntsville, Alabama. Upon receiving the Bachelor of Arts in Music from Dillard University in New Orleans, he went to Indiana University as a Woodrow Wilson Fellow. There he studied with Oswald Ragatz, earning his master’s and doctorate degrees, as well as the Performer's Certificate. As a doctoral candidate, he was affiliated with the university's renowned Black Music Center where he assembled a collection of organ music written by black American composers. Further study took place with Marie-Claire Alain and André Marchal, in addition to his work with Duruflé. From 1977 to 2018, Herndon Spillman served as coordinator of the organ program in the School of Music at Louisiana State University in Baton Rouge, where he held two professorships; the Herndon Spillman Endowed Professorship and the Carolyn Botkin Mattax Professorship in Organ. Currently he is Professor Emeritus, holding the aforementioned honorifics. In 2006, he became the first of two recipients of the Oswald Gleason Ragatz Distinguished Alumni Organists award presented by Indiana Organists United, an affiliate of the Indiana University Alumni Association. Recently, GIA published his edited version of “Anguished American Easter, 1968,” by the African American composer Thomas Kerr, Jr.
Herndon Spillman is represented in North America exclusively by Phillip Truckenbrod Concert Artists, LLC.